Ideas for my vacations, the transitional fall, and well into fall. I imagine strapless tops, crop tops, utility jackets, leather, stilettos, gladiators, over the bathing suits, you get my drift? Basically, I imagine this to be an all too fabulous piece to add to my closet! If the pattern is too much, they have these in all black! 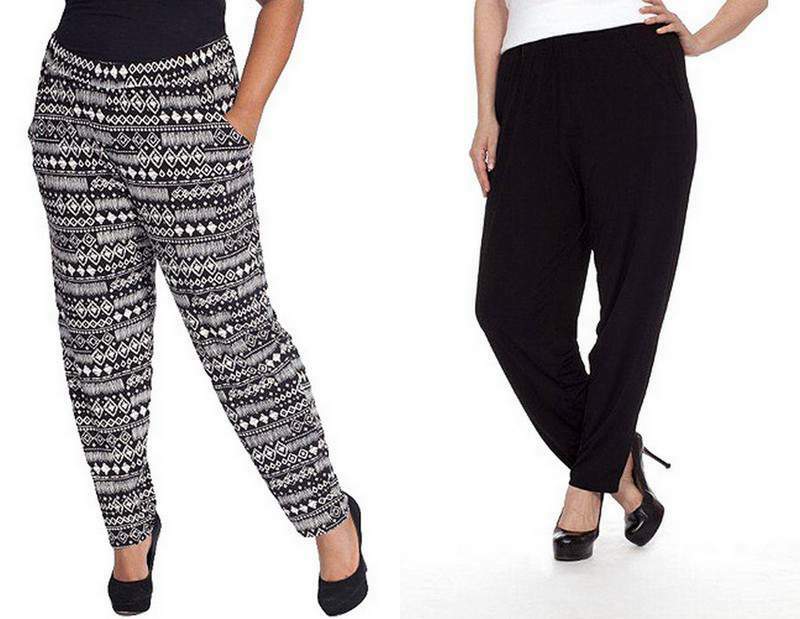 So you can baby step into this trend of the slouchier pant in plus sizes! Earlier this week, I alluded to this new brand at Walmart.com, Plus Moda. You are too familiar with this collection, just not by that name. The concept behind +PLUS MODA was essentially “pride and confidence.” We feel that the full figure woman has the right to look good and feel confident even when on a tight budget. She should have the same clothing options as slim size. And these pants? Look, at $15.88 and up to a 4X, I could take a few of them! As a matter of fact, I am going to! You can score these pants here, at walmart.com! What do you think of these? Am I alone here in the thought of having fun in the sun with these? Leave your comments below and let’s talk about it! Ok, not sure I can pull these off but OMG I wanna try sooo much…..! You totally could! Baby steps in black maybe? Less than $20 it cannot hurt! Love these pants! These are the exact ones I wore when you featured Curvy in Kansas City on Five Looks We Love – Reader’s Choice. They are absolutely fabulous, easily the best $15.00 I’ve spent on my summer wardrobe! Ordered the print pants! Now…what am I going to wear with them? I’d love for you to do a post with tops that are inspired by these pants! ( new to this print thing! ) Very excited!